Add a taste of the tropics to dinner tonight. 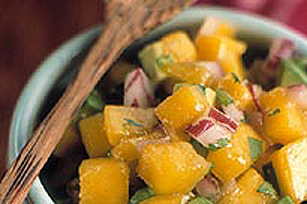 Combine 1 peeled and finely diced mango with 1/2 finely diced small red onion, 1 chopped avocado, a spoonful chopped fresh cilantro and 1/4 cup Kraft Classic Herb Dressing in a small bowl. Let stand for 4 hours or overnight to mellow flavours. To prevent the avocado from browning, cover by placing plastic wrap directly onto the salsa.